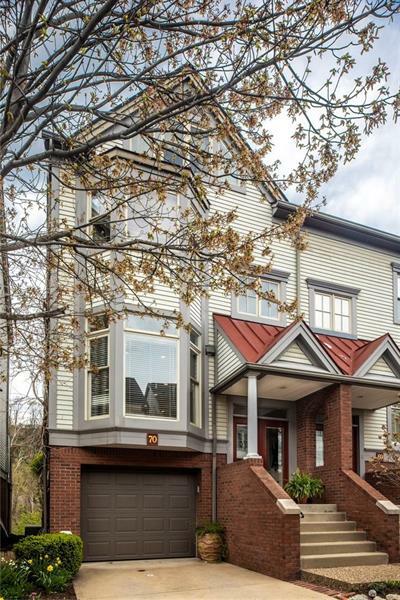 Welcome to 70 Waterfront Drive…Exquisite end unit townhouse on Washington’s Landing. Open floor plan with living room | dining room featuring rich hardwood floors, gas log fireplace, recessed lighting, custom built-ins. Ultra chic eat-in kitchen with birch cabinetry, soft pulls, stainless steel appliances inc Viking gas stove, 9′ by 4′ granite island. First floor private deck with views of waterfront. Three bedrooms including master ensuite with private deck. Den|office perfect for working from home. Wine cellar. Laundry. Sundance Cameo hot tub. Waterfront views from private patio with fire pit. Enjoy all Washington’s Landing has to offer: walking & bicycling trails, onsite marina, tennis courts, sidewalks & city lights, Redfin Blues Restaurant, Three Rivers Rowing Association. Minutes to Downtown Pittsburgh, Universities, medical centers, hospitals. Just a little bit of heaven…resort living in the City. Move-in ready!